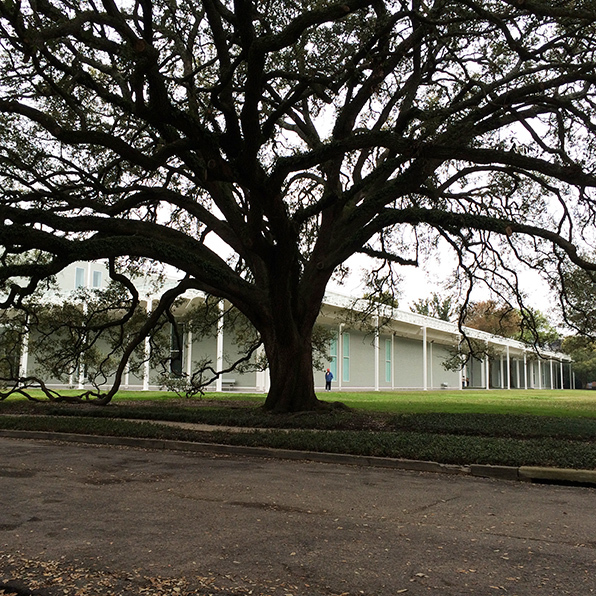 On a recent Texas sojourn, I took up the suggestion of a friend of mine and paid a visit to the campus of the Menil Collection in Houston. It is a series of buildings, most notably the Rothko Chapel and Renzo Piano's Main Building that hold the most interest for an architect and they make for an interesting contrast. The Rothko Chapel is a roughly hexagonal masonry building that is largely a single, large, skylit space with 14 massive paintings by Mark Rothko on each of the eight walls. The building was originally designed by Phillip Johnson with Rothko's input and then completed by local architects Howard Barnstone and Eugene Aubrey. Completed in 1971, the building was to be a complete environment for meditation, or maybe worship, of Rothko's work. Dedicated to ecumenical studies and human rights, the Chapel is a quietly intense space lined with pew-like benches and otherwise unadorned. The paintings are massive, color-field works like you would imagine from Rothko, each subtly different and trance-inducing. Entering into the space from the bright Houston sunshine, it takes a full 15 minutes or so for your eyes to adjust and register the subtle tones of Rothko's paintings that only seem like massive black panels at first. After a while the paintings begin to glow in purples and blues and warm browns, engaging the room and reaching out into the space. I am a big fan of Rothko's work and likely built this place up in my imagination and anticipation a bit too much. I found the building pretty uninspiring to say the least. The paintings themselves and the space created between them was intriguing, but frankly the reverential tone of the place - all pews and silence and meditating art students sitting cross-legged on the floor - did seem a bit much to me. True, we have raised art and museums to the heights greater than our churches and synagogues, but this was a little too explicitly reverential to what is afterall just space and paintings. Maybe that sounds odd coming from an architect and a painter, but possibly that is why I can't quite be so solemn in their presence. By way of contrast, I was very happily surprised by the wonderful Main Building designed by Renzo Piano in 1987. Like most of his buildings, it is a very clean and deceptively simple design that carefully controls the incoming natural daylight, filtering it and washing the walls. Unlike so many recent museums, the building did not overwhlem the works housed within and the simple cruxiform plan could be easily navigated without having to consult a map. What I feel was most successful in this design was the way it integrated into a neighborhood of small residential houses. The building sits in the middle of its park-like block, but it is set back far enough, and the building is quiet enough, to not collide with the tiny adjacent houses. The Main Building is beautiful and almost utilitarian in its simple task of being a venue for the amazing collection put together by Dominique and John de Menil. The Rothko Chapel seems to make the mistake of shooting for a mark too high.